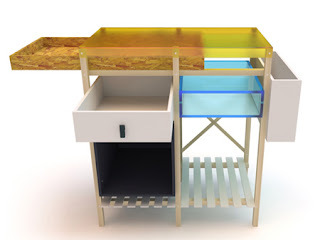 Mexican designer Christian Vivanco has developed a multi-functional work surface and storage unit inspired by the informal architecture of shanty towns..Called from a Lost City, it has an informal structure and employs mixed materials: oriented-strand board, bamboo and polycarbonate..
to write a story about the bride and groom's wedding night. sickness, disease or calamity to teach them. The lowest priced Software On the web affordable OEM software package web site : obtain application discount cost. You can also use their client list to confirm the way they do business and how they measure the success of campaigns. will help you increase your Word - Press traffic by making your blog search engine friendly. that can be too difficult to learn for standard web browsers. Energy Commission and the Department of Energy. to the anoxic basin, and lastly to the MBR basins. Did not thought about this until now :)Garcinia Cambogia Extract stops the pancreatic from splitting down starch into maltose and dextrin. It also prevents the production of alpha-amylase nutrients in the body system. changing into extra body fat by stopping the production of citrate lyase. a support to having a wonderful night sleep. web page and so far? I amazed with the analysis you made to make this actual put up amazing. This is actually the greatest budget-friendly method for your own tire and wheel demands. capable of go wherever you prefer when you wish, but you also should maintain it.